It used to be that the true mark of a hallmark champion was seeing its beaming mug and muscular bod on the front side of a Wheaties box, leading consumers to assume that said star athlete credited all those physical feats to the cereal packed inside. Well, that may still be true, but a few choice sports figures are quick to point out that a bowlful of flakes isn’t exactly on their choice diets. Look at New Jersey Devil player Taylor Hall, for instance. His breakfast ritual doesn’t include reaching for that General Mills box at all. Instead, he bulks up with a serving of sausage and eggs with oatmeal, and if there’s any green juice around, he’ll take a glass of that as well. 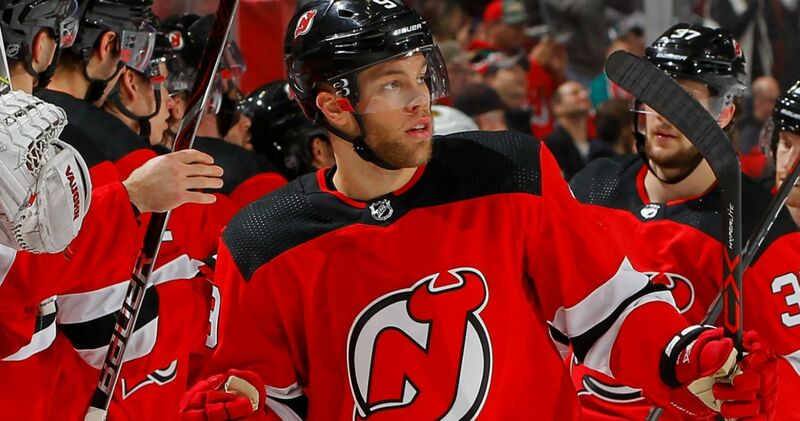 Even at the age of 26 and in his ninth NHL season, Hall feels fortunate that his metabolism hasn’t slowed down, as indicated by his performance last season when he hit a career high of 93 points including 39 goals. He’s currently second on the Devils points list after a dozen games in the NHL regular season. And while he’s not the type to spoil himself at the dining room table, Hall doesn’t think his intake is strictly responsible for how well he’s playing so far. That said, Hall tries to take in all the carbs and proteins he can to ensure his energy reservoirs are at peak levels. Vegetables are also high on his list, although he shies away from fruit. Hall’s also not big on sugar-laden items like ice cream or chocolate. The NHL great prides himself on ensuring his diet stays consistent, but like most non-athletic civilians, he’s prone to cheating occasionally. That’s when he’ll chow down on a cheeseburger or a pizza slice. He lives in a part of Toronto where ethnic restaurants flourish, so he’ll sample menus of more exotic fare, especially Indian or Mexican dishes. But on game day, his consumption is more focused, noshing on gluten-free pasta with meat sauce and salmon for that essential protein. Later in the day before getting his skates on, he’ll have a serving of rice with salmon and broccoli with some green juice. To stay hydrated, his other beverage of choice is a mixture of Catalyte and Amino Complex to take advantage of those electrolytes. That mix is also what he takes in during the game. As for those Wheaties, at least a slew of other stars from Seattle Seahawks pivot Russell Wilson to Boston Celtics hoopster Kyrie Irving are stepping up to keep that Breakfast of Champions legacy thriving. 49ers promote CB Greg Mabin to the active roster, sign CB Tarvarus McFadden to the practice squad.